Delavan - Welcome to the field where sun power and the sunflower meet. Well, not just one sunflower. More like thousands. And not just one solar panel, either. Thousands there, too. Convergence Energy of Lake Geneva is building one of the largest solar projects in the state, and the first that allows individual investors to buy a stake in the project. The Convergence Energy Solar Farm began construction last year on 14 acres near Dan Osborn's wholesale nursery. "It's a way for a small investor to have a part in it all," said investor Dave Smith of Libertyville, Ill. "When you live in a town home like I do, there's nothing you can really do." Smith bought one of the Convergence systems at a time when the economy and stock market were in rough shape. "I thought, why should I invest in anonymous equities and bonds when I can invest in a local company that I can keep an eye on, that's doing something good and will probably pay returns?" he said. "So I was very excited about it." 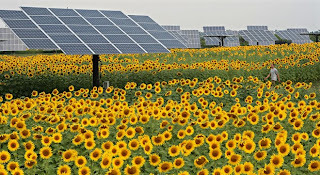 Johnson said, "We call it networked solar. It allows people whose homes aren't oriented toward the sun properly to take part. They might be in the woods. Or some may not like the aesthetics of the panels on the roof." The project allows those people to still have a stake in something they believe in, Johnson said. Convergence developed the project, obtaining funding from the state's Focus on Energy program as well as a U.S. Treasury Department financing program authorized by the federal stimulus package. Now, the company offers investors a stake in the project by investing at least $16,000 for a system, which amounts to 80 or so panels erected across three tracking towers. Each system of three towers generates up to 20 kilowatts of electricity, and dozens of the towers stretch across the land. One advantage, compared with conventional rooftop solar systems, is that these panels are erected on dual-axis trackers, so they rotate during the day to follow the sun. That generates about 30% more power than a fixed solar system, Johnson said. Convergence leased the land from Osborn, who opted to grow sunflowers this summer in between the rows of panels. He wants to press the sunflower seeds into oil that could be used in biodiesel. Osborn's business has been running a tractor on biodiesel for years, so this just made sense, he said. 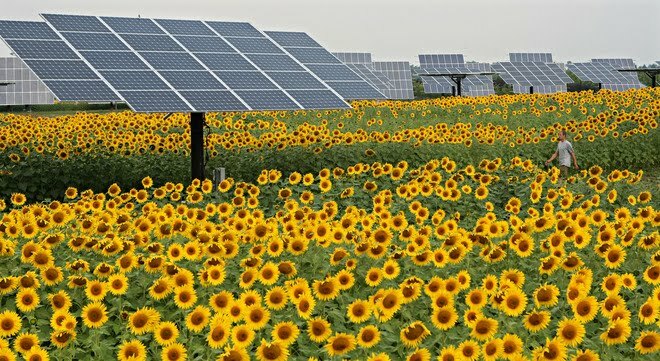 Osborn estimates he could end up with 600 gallons of fuel from the sunflowers that are now in full bloom and face toward the sun each morning. Osborn has invested in several of the tracking systems and says he did it to offset the power used by his business, his home and the homes of his children, who live nearby. "This is my little part, you know. It's clean and it's the sun, and it's what we should all be doing," he said. Power produced by the project is sold to We Energies, with Convergence in turn passing that income on to its investors. "It wasn't all about the money," Smith said. "I wanted to paint my own corporation's name on the pole and say, 'Look, we've invested in solar.' We're offsetting our carbon footprint." We Energies has been a strong supporter of the project, Johnson said. Ryan Logterman is proud to be a part of the project, which helped create jobs for his firm, Logterman Heating and Cooling, more than doubling its workforce in the past few years. Logterman also is an investor in the project. "We're all in. We are all investing in this ourselves. I've got the end of the second row," he said, gesturing across the field. "I'm on System No. 10." Logterman's heating, ventilating and air conditioning business employed three people five years ago when he began work in the industry as a solar thermal installer. Today, Logterman's business has 10 employees, one crew working exclusively digging trenches, building foundations and wiring Convergence Energy's solar panels. "It's a good feeling. We're doing something positive. We're generating renewable power, and I'm hiring more people and helping the local economy," Logterman said. "We try to buy as much material as we can from local wholesalers." Convergence is keeping it local, too, buying panels from the Helios Solar Works factory that opened this year in Milwaukee's Menomonee Valley. Convergence was Helios' first customer, and that firm has been adding more workers as it builds its customer base. Customers and investors alike appreciate the made-in-Wisconsin flavor of the project, Johnson said, adding that Helios panels were selected because they're more efficient than the typical photovoltaic panel. "The whole thing about renewables is about local economies. We're really striving to build local economies," Johnson said. "It's providing an opportunity for people who want to invest in solar and put a little more clean energy on the grid."